The imposing Black Russian Terrier was bred to intimidate—by his size, demeanor, and behavior. BRTs were developed by the Soviet government in the 1930s to protect military encampments in wartime, as well as to patrol prisons. Though they have a fearsome past, today these striking black dogs are devoted to their families and protective of children. BRTs are calm and confident and, when off duty, they are playful and affectionate. When out in the world, they are watchful and brave, alert to signs of danger. They may consider strangers a threat, which makes socialization critical. BRTs must learn at an early age that most people and other dogs are not a threat, or they will be difficult to manage. Black Russian Terriers are smart working dogs who need a lot of mental and physical activity to feel satisfied. If he isn't kept busy, the powerful BRT may develop destructive habits. As long as he is treated with respect and trained with confidence, this breed will honor the chain of command in the household. Black Russian Terriers are appropriate for only highly experienced dog owners. Black Russian Terriers are also known as BRTs and Black Pearls of Russia. Coat – Black Russian Terriers have a solid black double coat. The coarse outer coat is wavy and ranges in length from two to six inches. The undercoat is soft and dense. BRTs have abundant head and facial furnishings, with a full beard and mustache and fur falling over the eyes when untrimmed. The fur on the legs is dense enough to offer protection from brambles. The BRT's coat is subtly trimmed to show the outline of the body, without being too refined. This is a large dog with big bones—powerful in appearance and action. BRTs are well muscled, from their thick necks to their robust fore- and hindquarters. Though strapping, their size doesn't inhibit free movement. BRTs are always agile and swift. The breed has a noble carriage from their aristocratic head to their assertive stance. The Black Russian Terrier's disposition is brave and confident, with a calm alertness. They don't get carried away even in play because they are always on call to protect their family if needed. BRTs were developed in Russia in a secret government facility known as the Red Star Kennel during the years leading to WWII. The Soviet government wanted a fearless, intelligent, rugged dog who could patrol the country's vast borders, protect soldiers, and prevent prisoners of Stalin's Siberian gulags from escaping. The scientists and breeders of the Kennel intermixed 17 breeds to create the BRT, including Giant Schnauzers, Rottweilers, Newfoundlands, and Airedale Terriers. The final dog fulfilled all the requirements of the breed—they were strong, brave, and attached to their masters. When WWII ended, BRTs reentered civilian life as guardians of hearth and home. They were named an official breed by the Soviet Ministry of Agriculture in 1981, and were recognized by the American Kennel Club in 2004. Black Russian Terriers are affectionate, playful, and protective with their family members. With strangers, they are reserved and watchful for signs of danger. With training—which is critical for this breed—they can distinguish between threatening and non-threatening situations. BRTs are known to be protective and gentle with the children in their family. They are proud dogs who flourish when kept active. Are Black Russian Terriers Good with Other Pets? Black Russian Terriers are best suited to households where they are the only pet. They may tolerate other dogs and cats with whom they're raised, but you should never leave them unsupervised around other pets. BRTs should never live with small animals such as rabbits or gerbils because they will consider them prey. Black Russian Terriers were bred to be vehemently protective of their territory and their people. Are Black Russian Terriers Good Guard Dogs? The intimidating, brawny BRT makes an excellent watchdog and guard dog. They will alert the household to danger and likely make intruders turn tail. Black Russian Terriers have a steady energy. They are calm and alert through most of the day and never hyperactive. Without a purpose—agility training, obedience training—BRTs get out of sorts. Indoor Black Russian Terriers consider themselves members of the family and should live indoors near their people. Training of your BRT should be firm and consistent so they don't consider themselves masters of the house. The breed sheds only moderately, so fur isn't difficult to manage. Outdoor Black Russian Terriers benefit from having a medium to large enclosed yard where they can exercise and train daily, without worrying about the approach of unknown dogs or people. It's crucial the yard be secure and that you don't leave your BRT alone outside for long—otherwise he could escape and be a danger to himself and others. Exercise A healthy Black Russian Terrier requires an hour or more of exercise daily. Dog sport and agility training are musts for this breed. It helps them feel as though they are valued participants in the life of your family. Endurance Black Russian Terriers have the stamina and attention span for long training sessions. Running Miles: Healthy, adult BRTs can jog with you for three to four miles with ease. With their coat meant to protect them from arctic conditions, it's best to avoid runs during hot and humid weather. Hiking Miles: Well-trained Black Russian Terriers make excellent hiking companions. They can manage half- and full-day hikes with ease. Food Generally, this breed requires about 3 to 4 ½ cups of good quality dry dog food each day, given in two feedings. This will vary, however, based upon your BRT's activity level and age. Talk to your veterinarian about the optimal diet and quantity of food for your Black Russian Terrier. Alone Time Black Russian Terriers don't take kindly to alone time. This breed wants to work, rather than cool their paws. Seriously reconsider getting a BRT if someone from the family can't be with them through most of the day. They will develop destructive behaviors, such as barking and chewing if left to their own devices. Your Black Russian Terrier's medium-length coat should be brushed two to three days a week to prevent matting and knots. Pay particular attention to the longer hair on the head and legs, which will need gentle daily brushing and occasional trimming to remain manageable. A bath every month will keep your BRT's coat clean and fresh smelling. Wash your BRT's ears weekly with a gentle, dog-friendly cleanser to prevent dirt buildup that can cause infections. Brush your Black Russian Terrier's teeth several days a week, and trim his nails every month or so to prevent painful cracking. 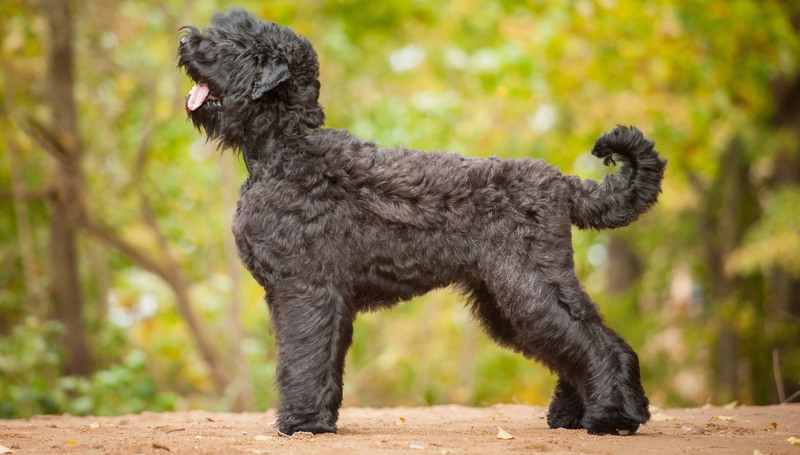 You can minimize serious health concerns in a Black Russian Terrier by purchasing from a reputable breeder who engages in responsible breeding practices, and through screening for common diseases and conditions. The whip-smart Black Russian Terrier will ace Obedience 101, as long as you earn their respect first. Be consistent, firm, and fair and your BRT will respect you as their leader, and follow directives. Basic and advanced training are important for the Black Russian Spaniel. Involve them in agility training, dog sports, or advanced obedience to keep them busy and happy. Even better—participate in all three with your BRT. Black Russian Terriers are not sporting dogs. Are Black Russian Terriers hypoallergenic? No. Black Russian Terriers are not hypoallergenic, despite their rough coat and Airedale ancestry. They shed throughout the year and, as a result, leave pet dander in your home. Pet dander is the primary cause of pet related allergies. Are Black Russian Terriers vicious? Certain breeds of dog are naturally more protective than others, and aggressive when necessary. Black Russian Terriers fall into this category, but they should never be vicious or go on the attack without cause. They are always guarded with strangers and you can't train this out of them. Training is important, however, to ensure they know how to manage their protective instincts. This is why BRTs and other protective breeds are appropriate for only experienced dog owners who know how to bring out their best qualities. Do Black Russian Terriers like to swim? Black Russian Terriers can learn to swim and some of them may enjoy the water. Every dog has his own unique likes and dislikes, however, so it's important to introduce your BRT to the water slowly and don't force the issue if they resist. Always watch your dog closely when they are swimming or near water.